Milford Malvoisin: or, Pews and Pewholders. The Offertory: A Sermon, Preached at Lichfield Cathedral, January 22nd, 1843. Principles of Christian Membership Exhibited in the House of God: A Sermon, Preached on Wednesday, the 19th of April, 1843, in the Parish Church of St. Martin, Colchester, after the Substitution of Open Benches for Pews. Church Pews, Their Origin and Legal Incidents, with Some Observations on the Propriety of Abolishing Them. London: Francis & John Rivington, 1844. Twenty-four Reasons for Getting Rid of Church Pews--or Pues. Cambridge: Published by the Ecclesiological late Cambridge Camden Society, 1844. The Laws Relating to Pews in Churches, District Churches, Chapels, and Proprietary Chapels, the Rights Incidental Thereto, and the Remedy for Wrongs. A Few Words to Parish Clerks and Sextons of Country Parishes. Published by the Ecclesiological late Cambridge Camden Society. Powers of the Vestry of a Church, and the Rights of Individual Pew Owners: Comprehending the Opinion of His Honor Judge Maynard, in the Case of Bronson and Others, against St. Peter's Church, Auburn, and the Report of a Committee of the Vestry of that Church. Auburn, New York: Finn & Rockwell, Printers, Steam Power Press, 1849. The Pew System the Chief Hindrance to the Church's Work in Towns: A Sermon Preached at Christ Church, S. Pancras, Advent, 1851, with an appendix. No place: no publisher, . The System of Free Churches: A Sermon before Christ Church, Elizabeth Town, N.J., March 5, 1854. New York, Pudney & Russell, 1854. A Letter Addressed to the Lord Bishop of Ely on the Equal Rights of All Classes of Parishioners to the Use of the Parish Church, and the Unchristian Results of the Appropriation of Seats. By John William Henry Molyneux. Oxford and London: J.H. & James Parker, 1856. Report on the Exempted Pews in St. Paul's Church, Boston and the Means of Releasing the Exemption for Easter, 1857. Boston: Printed by order of the Wardens and Vestry, 1857. What "Free Church" Means and Why Churches Should Be Free. A Pastoral Letter to the People of the Free Church of the Good Angels, Brooklyn, L.I. By John Henry Hobart Brown. New-York: Bowne and Hasbrouck, Printers, 1857. Preaching the Gospel to the Working Classes: Impossible under the Pew System. Free and Unappropriated Churches: A Sermon Preached at S. Philip's, Clerkenwell on January 30th, 1861. To the Poor the Gospel is Preached: A Sermon advocating the Right of the People to Freedom of Public Worship. Sheffield: Bell and Daldy, 1865. London: Printed by T. Brettell, 1865. An Open Church: An Appeal for A Free Episcopal Church in the City of Boston. Boston: Open Church Association, 1865. A Plea with Churchmen against Pew-renting. By A Clergyman of Western New York. Syracuse: Courier & Union Steam Printing House, 1866. Free Church and Choral Service: An Address Delivered at the Opening Service of St. James' Church, San Francisco. San Francisco: The Pioneer Press, 1866. Free and Open Churches: A Sermon Preached in Holy Trinity Church, Brooklyn, October 11th, 1868, and in Calvary Church, New York City, October 25th, 1868, at the Request of the Free and Open Church Association. New York: Free and Open Church Association, 1868. Free and Open Churches. A Sermon Preached in Christ Church, New York, October 18, 1868, and afterwards in St. Mary's Church, Brooklyn, at the Request of the Free and Open Church Association. The Pew System in the National Church: Why Do Not the People Worship? An Address Delivered at Sion College, London, on Thursday, 18th March, 1869. Pew Rents Do Not Support Churches. Philadelphia: Free Church Association, 1875. The Financial, Numerical, and General Experience of Free and Unappropriated Churches. London: London Free and Open Church Association, 1876. Free Seats in Our Churches: A Sermon Preached in the Church of S. James the Apostle, Montreal, by the Lord Bishop of Ontario, on Sunday, January 16, 1870. A Sermon Preached before the Free Church Guild, in St. Ann's Church, N.Y., December 4, 1873. New York: Julius Schlueter, 1873. Reasons for Contributing Liberally in the Weekly Offertory to the Church's Support. The Church of Christ a Free Church Freely Maintained. A Sermon Delivered before the Free Church Association on the Occasion of Their First Annual Meeting, in St. Mark's Church, Philadelphia, May 28th, 1876. Philadelphia: Free Church Association, 1876. 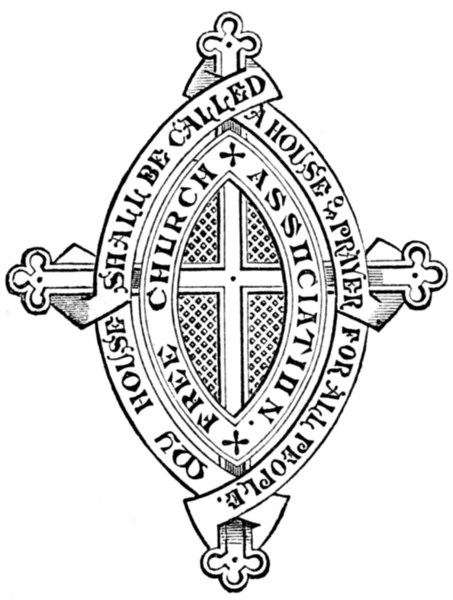 Free and Open Churches: A Sermon Preached at St. Paul's Cathedral on the 23rd of June, 1876, the Tenth Anniversary of the London Free and Open Church Association. A Sermon Preached at the Consecration of Grace Chapel, New York. New York: McWilliams, White & Co., 1876. Free and Open Churches. A Sermon Preached at the Parish Church of Stoke-upon-Trent during the Church Congress, on the 6th of October, 1875. London: The London Free and Open Church Association, 1877. Does the Free Church System Injuriously Affect the Missionary Offerings of the Church? Correspondence between the Bishop of Western Michigan and the Free Church Association. Philadelphia: Free Church Association, 1880. The House of God the Common Right of All Men. God's House Open to God's Children: A Sermon Delivered before the Church of the Good Shepherd, Boston. Boston: Free Church Association, 1881. A Few Words on the Principles of the Scottish Free and Open Church Association. Edinburgh: St. Giles' Printing Co., 1883. A Sermon Delivered before the Free and Open Church Association, on Its Eleventh Anniversary in the Church of the Annunciation, Philadelphia, on the Second Sunday after Easter, May 9th, 1886. The Free Church System: Part of a Paper Read before the Guild of the Church of St. Asaph, Bala, Pennsylvania. Philadelphia: Free and Open Church Association, 1890. Waymarks, 1870-1891: Being Discourses, with Some Account of Their Occasions. XIX. The Free Church the Witness to the Brotherhood of Humanity in Christ Jesus. A Sermon Delivered before the Free Church Association on the Occasion of Their Second Annual Meeting, May 17, 1877.